Home → Blog → What’s The Average Web App Development Cost? High-quality web apps are in favor right now, and this fact has a simple explanation: they're really useful in solving a number of tasks and complex problems. And if you're ready to order the web app development, you're probably wondering how much it might cost. If you read our previous articles, you understand: it would be difficult to determine the exact and fixed price of building a web app. But we’re able to provide enough information so that you can calculate expenses and draw up your budget. Okay, what’s the average web app development cost? You'll find all the details in our blog post! Before proceeding to the cost to build web applications, let's take a look at their main advantage. Such information will help you make the right choice when deciding what kind of site is worth ordering. A web application is a website which hosts pages with partially or completely unformed content. The final content is being generated only after the site visitor has requested a page from the web server. One of the benefits of the described approach is the fact that there is no dependence on a particular user's operating system. Web apps allow you to collect, store, and analyze data received from site visitors who in turn are able to quickly and easily search for the desired information, it's an online resource which includes extensive and diverse content. It remains to find out how much such a web application costs. What does web app pricing include? The cost of web application development depends on several factors. After determining each of them, you can calculate the indicative price. Of course, it’s the most governing factor in determining the cost of web apps. Complex development solutions are more expensive, and it's a small wonder. So, what do you want to have in the end? What functionality do you need? By answering these and other similar questions, you’re getting an idea of the price range. Strangely enough, the second factor also affects the price issue. The more specific your business niche, the more difficult it’s for specialists to figure it out. So, they’ll spend more time on web development, which will lead to an increase in the cost of your project. If you’re limited in time and set strict deadlines, expect the increased web app development cost too. It's pretty obvious, isn't it? Experts'll have to work hard to meet a tight schedule, and this requires more effort. Project manager. He’ll oversee the project and serve as an intermediary between you, the client, and the development team. UI/UX designer. Good design is a sure step to success. So, you need to hire talented UI/UX experts. Web developers. Their work takes a greater number of development hours and especially affects the cost to create a web app. QA engineers. Their task is to test the product at every development stage. Hire a team which employs all the listed specialists, as each of them plays his significant part in the successful implementation of your project. Below, you'll find more details on how to choose the proper application development company. This is another inevitable source of web application development costs. The advertising campaign at launching the app would help you to recoup your expenses and attract potential customers really quickly. Keep in mind that creating an application is just the beginning of your journey. In the future, you’ll need a support team able to monitor the activity of your web project. Consider this factor when planning your budget and thinking of your potential web application development costs. Stages of creating a web application. To find out the average costs of web apps, you need to know what elements the app will consist of and what steps the development process involves. Your intention to create a web app means you already have the Idea of your future online product. Now you should formulate it clearly: what exactly do you expect to get as a result of cooperation with web app developers? Maybe you want to supplement your shop with its web version? Or you’re willing to advertise your services through a landing page? Think about it! Understanding your needs is necessary to pass the following steps of the strategy more successfully. The task of the 2nd stage is to analyze the supply and demand. You should build a web app which would be both interesting to the consumer and able to overtake your potential competitors’ similar resources. And that’s why it’s so important to conduct a survey (namely, a desk research). You can hire a professional company or limit yourself to your own means (not the best option, but what can you do if you need to cut web app development costs!). After analyzing the information gathered by that time, you can make a list of requirements for the future web app. These requirements are nothing more than application features. Presumably, you’ve already found a suitable application development company. Now it’s time to tell developers about your wishes and make up the requirement specification. At the next stage, a prototype is being created and wireframes are being built. The result is your clear understanding of how the finished product would look like. Prototyping is a complicated and creative process which, of course, also influences the cost to build web applications. But this is the case when saving only harms the cause. We, the people, are visuals, and we subconsciously have a preference for those things which seem more attractive to us. This also applies to web app development. Therefore, the interface design should be appealing, user-friendly, and modern… and not cheap! Bear that in mind when determining the cost of web apps. When it comes to web apps, the development process includes the frontend and backend programming stages. Backend development means programming a website and filling it with functionality, and Frontend development involves working to create a public part of a site which a user directly interact with. This is an important stage which some clients are trying to avoid thinking it’d be a great way to reduce the average costs of web apps. And such a dangerous desire may lead to the fact that your web app will work incorrectly. Of course, you’re unlikely to be able to conduct all the required tests on your own. That's when you need professional help from QA engineers! Being tops in their field, they can ensure your web service is working just the way you're expecting. Launching the project properly is the task as difficult and important as the one which relates to the intention to build a web application of the highest quality. You’ll need the assistance of all the experts you've hired so that your app could successfully break into the market. Simple apps which are sites with basic functionality, simple landing pages, elementary online stores… Minimum content, minimum interactive elements! It takes up to 1 month to implement such a project, and the web app development cost varies between $ 3-17K. Pro level. These are much more interesting, professionally designed web projects with interactive pages and a lot of information. Among such web applications, there are e-commerce sites of medium complexity, prototypes for future multi-functional Internet portals, web representation of small businesses, etc. These projects will cost about $17-55K, their development requires up to 3 months. Complex projects. These are custom web applications of a high level of complexity, with an exclusive СMS and thoughtful UI/UX design. They're aimed at bringing their owners a stable profit and helping automate their company's business processes. Web application development costs are about $55-250K (up to 6 months of work). Corporations. These web applications are ordered by large corporations and promising startups with a good outset. In this case, clients are ready to pay over $250K and spend more than six months to build a web app. 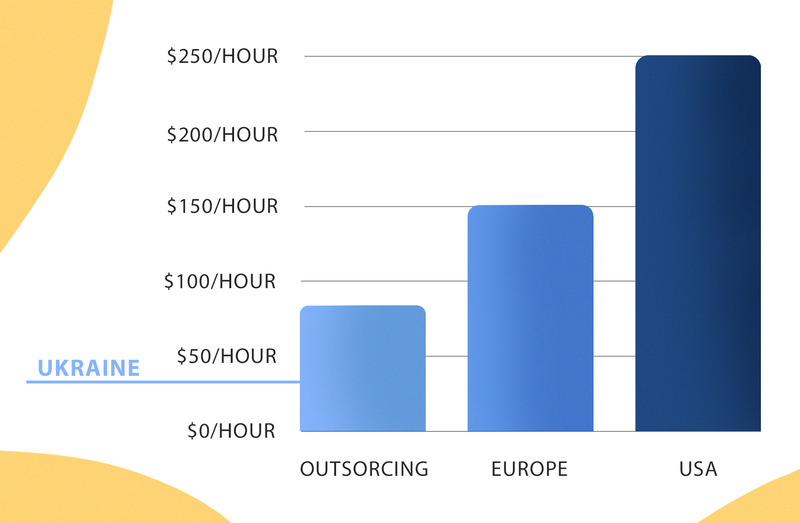 The infographics below illustrate different web app cost variations. Of course, we gave you a very rough estimate. To form a final opinion on the cost of web application development and your potential incomes, let's try to draw general conclusions. How much does it cost to make a web app? When calculating the cost of your project, it’s important to monitor your expenses and income opportunities. The main goal is to reduce first ones and expand your profit potential. By the way, a lot of factors are able to increase or decrease the costs of web development. Let's discuss them in sequence. What to do if you don’t agree with the price of building a web app? In some cases, the amount of money paid in software development unpleasantly surprises you, the cost to create a web app is higher than expected. You understand that recouping your expenses won't be a simple task… but it’s too late! What's done is done. But don’t worry! The situation is easy to prevent if you take action in advance. If you want to build a web app, you’ll need qualified assistance. But remember, different app development companies have different rates, and a higher cost doesn’t always lead to higher quality. Much depends on the company reputation and name, on its experience in the market, but the location also plays an important part. Now let's underpin these words with facts. So, the US web app developers have very high queries - their rate is about $150-250/hour (it means web application cost might be really frightening). Experts from Western Europe are more moderate in desires and ask for $80-150/hour. However, this price is still highly overrated, and if you have an average (or even smaller) budget, a reasonable option is outsourcing, that is, cooperation with web specialists from Eastern Europe, Middle East or South America. You’ll significantly save: the rate of these development teams is only $30-80/hour. By the way, we advise you to pay attention to professionals from Ukraine: offering relatively low prices (usually not more than $ 50 / hour), they’re very experienced in the IT area, and their web projects have a clean and understandable code. Do you want to get more information on how to choose an expert from Ukraine? Read one of our blog posts! We strongly recommend that you document each stage of the development process. Specify all the deadlines and maximize the various options for the succession of events. So you’ll protect yourself from unforeseen situations (and consequently, unplanned expenditures). The MVP model is a great idea if your budget is too small to implement a complex and multifunctional web application (at least, at first). In such a case, it’s reasonable to offer users a product with minimal functionality. Later, when the project begins to pay off, you can gradually complicate your web service. Moreover, this approach gives you another undeniable advantage: you can find out the consumer's opinion about what features he would like to see in your app and act on the basis of clear prerequisites. 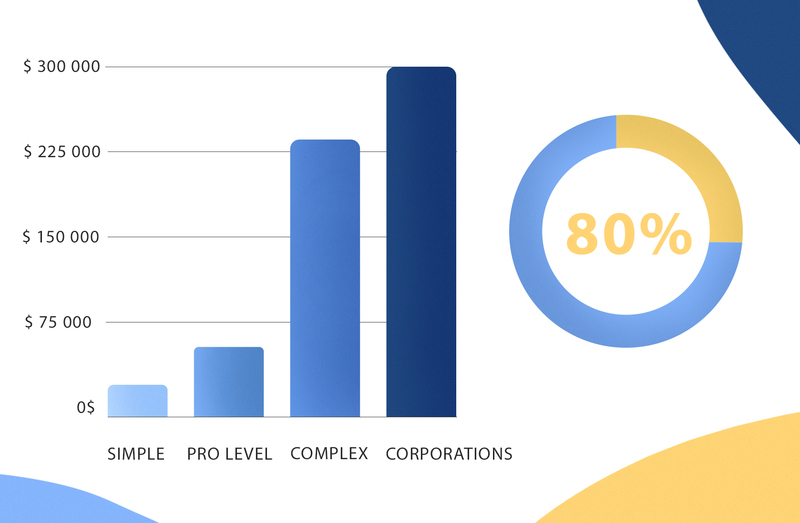 Typically, the cost of the MVP model ranges between 50-200K (depending on the list of requirements and the rate of the app development company). Don’t be a perfectionist if your budget doesn't allow such a luxury. And if the MVP model seems too simple to you, then go the other way: instead of abandoning the expensive features, try to find their cheaper substitutes. So you significantly reduce your web application cost. How to increase your income? We’ve talked about how you can cut down your expenses during your web app development. Now we’ll discuss the ways to increase your future incomes. Carefully analyze your potential client and main competitors. Make sure you’ve taken every detail into account. Web app development, like any other business, requires order, control, and planning. We’ve already mentioned the promotion issue, but it’s better to place emphasis on the important aspects of your strategy. And this is just the case. Allocate money for advertising and promoting your application. It's the only way to make your dreams about a profitable web app come true. Now you know how we estimate website and app development costs, and, hopefully, you're ready to collaborate. And we, in turn, are ready to provide you with professional assistance in creating high-quality web apps. Our Agilie team offers services in mobile and web application development including the implementation of a variety of business requests and the creation of sophisticated analysis algorithms. We develop projects of any complexity: CRM for business, payment and management systems, corporate portals, etc. At the same time, our rate is quite moderate, and we always accept compromises. In other words, the price of building a web app will satisfy you. We’d be happy to create a web app for you - the one which has a flexible scalable architecture and, therefore, can be easily modified (which seems important considering the emerging tasks). And, of course, we can ensure any level of data protection and encryption (depending on the final requirements for the future web app). Let's start our mutually beneficial cooperation! We promise you’ll get exactly what you hoped for (and even more!). Contact us. Today, fitness apps belong to the most popular type of healthcare mobile services. It means, they can become an excellent source of constant income! However, there is still a question of the price, that is: how much does it cost to make a fitness app? How much does it cost to build or redesign a website? How much does it cost to build a website? Click here and read our article on website development costs and ways to reduce them.